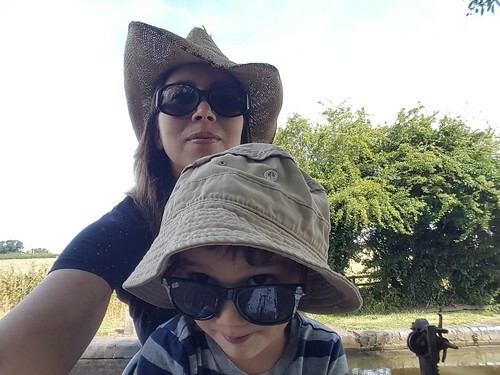 Keiki and I sitting on a lock with our shades and our hats on. The bloke and Humuhumu went off an adventure last night, so Keiki and I had the day to ourselves. 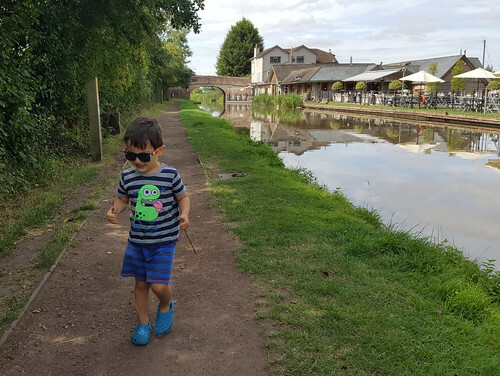 We got up late, had a leisurely breakfast, played some games and then went for a walk along the towpath. Keiki found some sticks. Also, clover (which he ate), blackberries (which he ate), plums (which I did not let him eat because they weren't ripe), and butterflies (which he didn't attempt to eat, thank goodness). 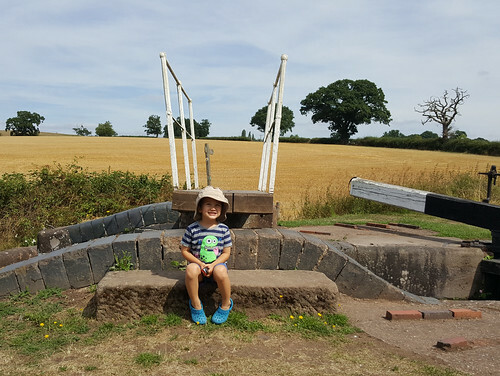 He walked all the way up the towpath to this little bridge, and back again. He was very proud of his endurance, and also quite hungry. So we went to the pub. He started off with salad from the salad bar. Then he had more salad for mains. major_clanger and attimes_bracing, you may remember this as the crispy duck salad I ordered when you visited, and which Keiki ate most of. Well, this time I ignored the children's menu full of bland stodge, and ordered it for him. 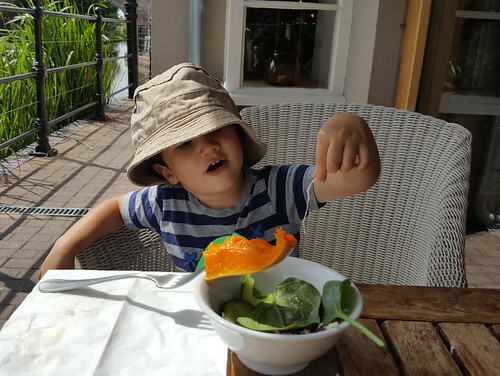 The waitstaff were very surprised when they set the chicken burger and chips in front of me, and the duck salad in front of the three-year-old. They were even more surprised when they took away a nearly-empty plate from him and had to wrap up half of my enormous burger. 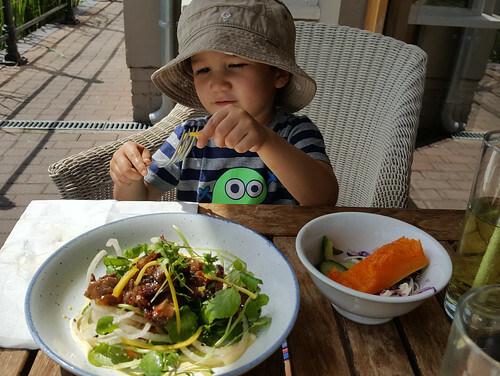 He can't get enough of those strips of mango and mouli, and the watercress. Humuhumu would not have touched a single thing on either of those plates apart from the cucumber. Because he was so good at the table, sitting nicely (mostly), saying please and thank you to the waitstaff, and conversing with me, he was allowed to order pudding. 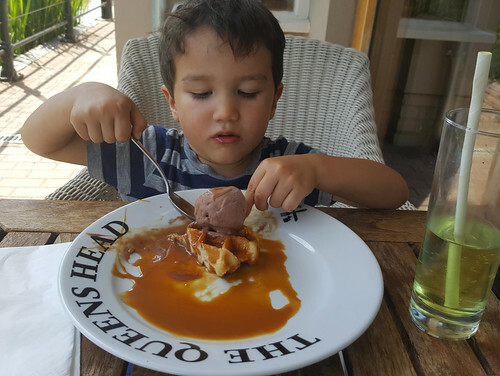 He chose the waffle with chocolate ice cream and polished it off. We got home about fifteen minutes before some friends arrived for a playdate. Having used up all his goodness on the meal, Keiki proceeded to behave very erratically through the playdate. He and the older girl (Humuhumu's friend) kept sneaking off to the back of the garden to feast on sun-warmed ripe blackberries, an activity their mums couldn't reasonably object to. But he and the younger boy, who is Keiki's age and who is normally his friend, suddenly became rivals. So it didn't go as smoothly as it would have if Humuhumu had been there, sadly. And then he had a meltdown just before they left. Belatedly it struck me that perhaps he wasn't well, and I checked his temperature. 38 C. Ah. A dose of Calpol and a couple of episodes of the Octonauts from the shelter of Mummy's lap and he was much calmer. He was quite pleased about having the whole bath to himself, and about being able to choose the selection of books all on his own. He settled down quite readily when it was time for lights out. And now, it is gin o'clock for Mummy. This entry was originally posted at https://nanila.dreamwidth.org/1179844.html. The titration count is at .0 pKa. That salad does look tasty! But those utensils - that fork is MASSIVE! I don't think I could use it - how on earth did Keiki manage? Heh, he was struggling a bit! He had to use his hands to help things onto the fork. The server eventually noticed, and brought him a smaller one. Thank you for the ego-strokes, Pencil! Wow. Great endurance for the little guy. No wonder he was able to polish off that meal at the pub. Looks like a nice walk. I had intended it to be a short walk, but I forgot how much Keiki likes to stop and look at eeeeeverything and learn what the names of insects/plants/trees/birds are. We were outside for almost two hours before we remembered lunch. Looks like you two had some fun times together! Keiko's salad looks very good, though. I think I'd have like it! It's delicious. Even if you didn't like crispy duck or were veggie, I reckon you could substitute grilled halloumi and it would be equally good.